A Florida mom becomes a local playground expert | KaBOOM! On the first day, I decided to take the boys to the nearest neighborhood park. That would at least get us out of the house. While they were enjoying the playground, it occurred to me that I should challenge myself, and my kids, to get out each day and… document our excursions. We packed a cooler and headed to the next-nearest city park, which we had never visited before. My kids were having so much fun, I practically had to beg them to leave. I decided to up the ante on the previous day’s challenge: Could we not only get out of the house, but visit a new park each day? Surely we could find 81 more parks within driving distance from our house. The so-called Great Park Pursuit didn’t stop there. When Tracey shared her summer adventures with KaBOOM!, we liked the idea so much that we decided to challenge parents across the country to do the same. For three years now, the KaBOOM! Summer Playground Challenge has asked families to get outside with their kids and while they’re at it, to document the playgrounds they visit on our crowd-sourced Map of Play. 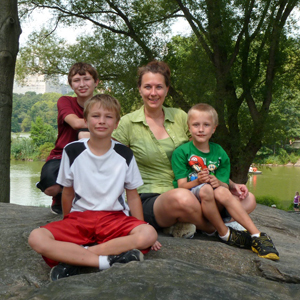 Tracey and her boys have now spent four consecutive summers exploring playgrounds. In the process, they have visited and mapped every publicly accessible playground in Safety Harbor and traveled all over Pinellas County to find new places to play. Our all-time champion mapper, Tracey has added 132 playgrounds to our Map of Play and a staggering 1,399 photos! Because of Tracey’s tireless efforts, KaBOOM! can now map Play Deserts in Pinellas County – that is, areas that are child-rich but playground-poor. Her data is vital to helping us figure out where more playgrounds need to be built. What I've learned… is that kids don't stay young very long and to appreciate every day with them. Although most playgrounds are "recommended" for up to 12 years old… my oldest [son’s] feet touch the ground while holding most monkey bars. As he continues to "grow up" both physically and emotionally, I know that spending summers together at playgrounds will eventually come to an end. Maybe, Tracey muses, she can map basketball courts next? 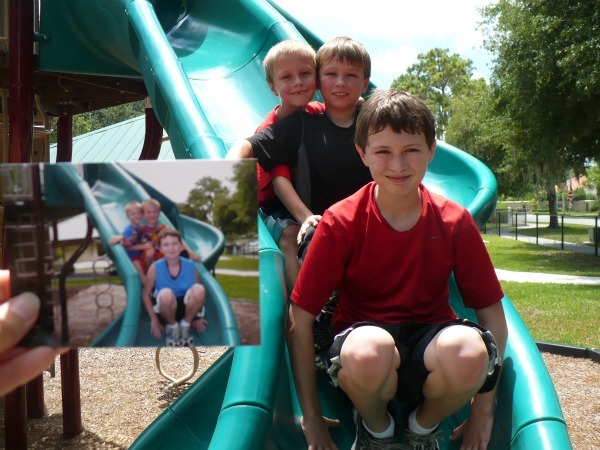 In 2011, Tracey and her boys revisited one of the first playgrounds they went to and re-posed for a photo, showing how much they had grown in just two years.